Report: David Ortiz will retire after the 2016 season. After having another great season in 2015, David Ortiz will retire after the 2016 season per Ken Rosenthal. Ortiz, who turns 40 tomorrow has a team option to 2017 so it is really up to him if he wants to continue as the DH for the Boston Red Sox. 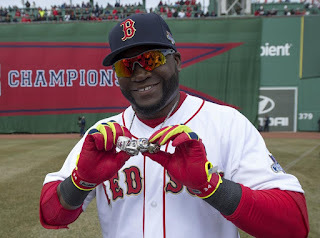 Ever since 2009 when he posted the lowest batting average of his career (.238), we have been debating if Ortiz is done. Then he reached the 30/100 mark again in 2010, made it to the All-Star team in 2011 but injured his right Achilles tendon in 2012. Ortiz only played for 90 games in 2012, the lowest since 2001 and since this injury seemed dead serious at the time (he says the injury is one of the reasons he doesn't like playing in the National League, where he usually plays as a 1B) it was fair to say that 2013 was going to be his last season. Then came 2013. Ortiz started the season in the DL, but returned to action in the first Red Sox game after the Boston Marathon bombing. At a time where Boston was hurt, Ortiz was the voice the city listened to. Not even the POTUS or Mayor Menino are remembered for a quote so strong at the time. It is Red Sox DH's words we still remember. “This is our f*cking city, and nobody is going to dictate our freedom. Stay strong!”. The Red Sox made it to the World Series that year, mostly because of Big Papi's performance in the ALCS. After the Red Sox only had one hit in the first game of the series against Detroit and trailing 5-1 in the 8th inning of the second game, Ortiz stepped to the plate with the bases loaded and two outs. What are the odds that the greatest clutch hitter in Red Sox history was going to be in that situation, where his clutch status was going to be tested again? Obviously he delivered with a game-tying grand slam and the Red Sox won in walk-off fashion on the next inning. In the World Series, Ortiz crushed the Cardinals with a .688 batting average, two homers, six RBI and an impressive 1.948 OPS. His performance during the World Series was awarded with the MVP honors for the first time in his career. 2014 and 2015 were disappointing seasons for the Red Sox, but not for Big Papi. He still reached the 30/100 mark in both years and hit his 500th home run last September. All of this happened after 2009, where we were sure that he was done. Ortiz hasn't officially commented on Rosenthal's report so it is not 100% sure that he'll be gone after 2016. However, he ended 2015 on a high note and it looks that he is going to have another productive year in 2016. If Ortiz wants to play it safe and have the Hall of Fame voters remember him as a great hitter, he has to retire while he still is a terrific player. After all, Father Time hasn't caught up with the Large Father. The great Bill Simmons wrote this article after the 2013 World Series, which for me it is the best ever written about Big Papi. Here's the link if you want to take a look. Do you think Ortiz actually retires after the 2016 season? Is he a solid candidate for the Hall of Fame? Leave your comments below and follow us on Twitter at @RedSoxLife and once you're there, follow me at @iamjorgecamargo.